SPECIAL TO THE NEW YORK TIMES. May 24, New York. 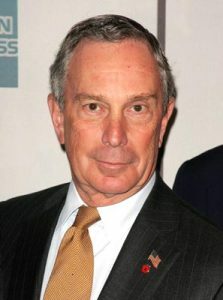 New York City's Mayor Michael Bloomberg announced a series of bold new initiatives to protect the health of New Yorkers today. The Mayor's approval rating of 76% has been largely due to his efforts to safeguard city residents from tobacco smoke, trans fats, cars, guns,�and other ills�with which the ignorant masses are too stupid to deal with on their own. He seeks to build on this foundation with his ambitious new program, entitled "A City That Really Cares." 1. Banning the sale or wearing�of heels on women's shoes over 2" high. 2. Requiring the wearing of warm scarves when the temperature drops below 40 degrees F.
3. Banning sunbathing in all New York City parks and beaches. 4. Requiring a serving of broccoli and carrots with every restaurant meal served within the five�boroughs. 5. Banning the dangerous habit of swimming�at ocean beaches. 6. Requiring the unplugging of all TVs and toaster ovens�when not in use, due to fire hazard. 8. Requiring the wearing of sturdy rubbers during rain, and lined boots during snow. 9. Requiring the wearing of hats during sunny days, and wool hats when the temperature drops below 40 degrees F.
10. Banning the use of iPods on city sidewalks due to the street-crossing risks iPods cause. 11. Banning all dangerous sports in schools or on city property. While the list is not complete, this will certainly�include football, soccer, dodgeball, and handball. Running and jogging may also be banned, as they contribute to joint diseases and anorexia nervosa. 12. Banning the�sale or use of any tobacco products indoors, outdoors, or in any vehicles other than golf carts, limousines, or private jets and helicopters. Violators will meet a stiff fine of $250 per incident. One thousand police officers will be transferred to�a new�Public Health Unit of the NYPD�to monitor compliance, with many more expected. This unit will have extensive rights to enter your home to check for tobacco smoke, trans fats,�and safe TV use. During his presentation, the Mayor emphasized his committment to health. In response to a question asking why he had not included a ban on sale of alcohol products, meat, candy, soda, junk food and and�fried food, the Mayor replied "Now just hang on. This is�only Phase One. As people get used to following good habits, we will introduce further steps in our "The City that Really Cares" program. So let's be constructive and positive, and work together in a stepwise fashion�to�guarantee good health for all New Yorkers." Public health experts praised the Mayor's presentation. Dr. Harvey Weiss, Professor of Public Health at Columbia University and an advisor to Mayor Bloomberg,�attended the press conference and stated "This is a wonderful beginning, but there is so much more we can do to help people." "The people of New York�need to understand that we really care, and we care�enough to include significant enforcement in�this program. We will get to butter, chicken fat, lard, eggs, meat,�cheese, creme brule and ice cream as time goes on. Plus we are deeply concerned about cell phone usage, overly-tight lingerie, poorly-fitting shoes, and of course the crisis of�noise pollution. We�hope to�submit requirements for noise-free jackhammers and garbage trucks�in the near future." "Health is too important to be left up to people." Hahaha. I am wondering when he will enact the much needed legislation that requires wearing helmets in cars, boats, sleds and toboggans. You're yanking my chain, right? This is a parody? Please say it is. Hey, I only mention it because these are VERY plausible things that liberals would WANT to do! Do you know how long it took me to chase my wife down and cut a half inch off her shoes! The part about government helping with poorly-fitting shoes sounds very good. You forgot the seatbelts on motorcycles. May 24 minus April 1 is 52 days overdue for an April Fool's joke. That's about all that makes sense with that list.